This is the third and final step needed to finish the quilt and make it ready to use and thankfully, it doesn’t involve many steps or materials and can be finished in a relatively short amount of time. Quilting per se is the actual stitching used to secure all three layers so during use and especially washing, the batting inside doesn’t get moved around and bunched up in one corner. You may have seen “quilts” or blankets where this has happened – the cause may always be apparent but preventing this problem is now much easier. The secret is using a stitch width to match the batting you are using. When you walk over to the batting section of a craft or fabric store, like bolts of fabric, what you see can be overwhelming. There are many types made from different materials and each woven with its own unique structure. The denser the weave the farther apart you are able to stitch. A looser weave requires stitches to be closer together. For example, a typical cotton batting will recommend a stitch width of up to 8″ where a polyester batting will typically recommend the stitches be placed much closer: 2″-5″ apart. The type of drape or “hand” you want your to quilt to have is another consideration. Since we want our quilt to drape nicely over our shoulders or around our legs and feet we will be using batting that is polyester. A cotton-polyester blend is also a good choice for a first quilt. Polyester batting is the least expensive, its thicker (has a higher loft) and weighs less than cotton so it keeps you warm without the added weight. Polyester does not shrink, resists mold and mildew, comes in various thicknesses and is overall easier to quilt – especially when doing hand stitching or tying by hand. NOTE: There are those who avoid synthetic fibers at all costs and prefer cotton – many quilters will use nothing but100% cotton or a nice 80/20 cotton/poly blend (or wool or bamboo). Again – there is no right or wrong batting to use but whatever you choose to read the package label carefully to be sure it delivers the qualities you are looking for and is suitable for the stitching you want to use. Which brings us to reason you are here! The “quilting” method we are going to use for this quilt is hand tying. 2) Thread – a strong thread i.e., embroidery or crochet thread. Avoid a thread that is too thick to easily pierce all quilt layers. I personally like a pearle cotton thread for hand tying. We used a polyester batting (8 oz weight) in our quilt sandwich so we will be tying (quilting) a knot every 4″ -5″ apart. The next consideration – what color or colors to use. Our pieced top consists of a series of squares – white and print. Going with one color such as white is perfectly fine. When determining the color of thread to use for machine or hand quilting most quilters prefer to use a thread color that closely matches the fabric – but this is not always the case. Often, a contrasting thread can add a bold visual interest – again, there is no right or wrong way. The color (s) you decide to use will be right color! 1) Measure off a 22″ – 24″ length of thread and use this to thread your needle. 2) Locate the approximate middle of a square and this point to insert the needle downward through all three layers. 3) Pull the thread through until an approximately 2″ tail is remaining. 4) Now, using the tip of your needle locate a spot about a 1/4″ away from the original spot and bring the needle back up until you feel a slight resistance. This tells you the thread is all the way pulled through but go slow here – you want to make sure the 2″ tail is still visible. 5) Again, insert your needle down through the original spot and come back up. 6) Cut the thread leaving another 2″ tail. 7) Ties the two tails together and you’re done! Just repeat this for the number of squares you have or the suggested distance apart as indicated on the batting package you used. This style of quilting does a very good job holding all the layers of a quilt together but it over the long run it is usually not as secure as a quilt that is stitched by machine. Limit the number of times your hand tied quilt is put through the wash and you will be able to enjoy your new quilt for many years! 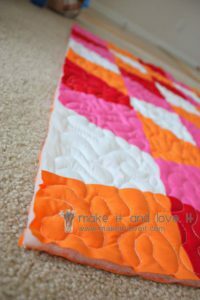 This is part TWO of a three part series of instructions on how to make your very first quilt. Since this phase involves using what is known as a quilt “sandwich, I have divided each section using food terminology. As a side benefit, you may also see a correlation between making a quilt and following a cooking recipe or just about anything else. There is a process and a sequence – if followed – will bring you desired results, every time. 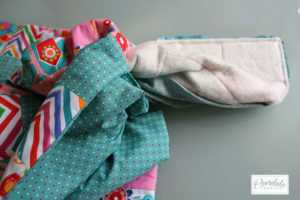 The term “quilt sandwich” refers to the appearance of the quilt with the batting (plain filling) layered, or sandwiched between the two pieces of pretty fabric – the top and the backing. For our new quilt we will place our layers so the “filling” is on the bottom with the two fabric layers on top but in the last step we will turn the entire quilt inside-out which will produce the typical “sandwich” effect. 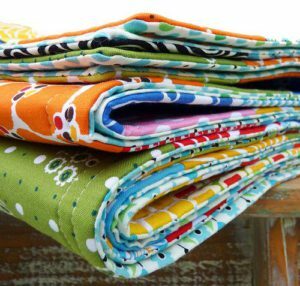 To put our quilt sandwich together there a few items we need to retrieve from the cupboard or wherever it is you store your quilting and sewing tools and notions. 1. A large continuous flat surface area – a table top, floor – any place large enough to spread out the quilt nice and flat. 2. The first layer to go directly on the table or floor will be the batting. This is the soft, fluffy inner layer that gives the quilt softness and warmth. 3. The next layer will be the backing – this is the fabric that will end up as the “back” of the quilt and is typically one large piece of fabric cut 3-4 inches wider than the quilt top. Place this piece with the print or right side facing up. 4. The last layer will actually be the pieced quilt top. Turn it over with the right side down – the seams will be facing up. 5. Taking both hands and starting from the middle, smooth out all layers trying to remove as many wrinkles as possible. A second set of hands (a nice quilting friend!) also comes in handy here. a. Straight Pins – Starting from the middle and moving outward place a pin through all three layers about every 5-6 inches apart. b. Quilting Safety Pins – Again, starting from the middle and moving outward place a safety pin through all three layers of fabric and fasten about every 5-6 inches apart. NOTE – Straight pins are somewhat faster, easier and cheaper to use however, the sharp points are visible and as you move the quilt through the sewing machine while quilting it’s very easy to get pricked. The safety pins are curved but are just a tad more time consuming to place but once in, you don’t have to worry about locating the points to prevent being stuck. I use both but I will admit I much prefer using safety pins. This next step puts it all together – literally. There is a bit more sewing involved but not much. 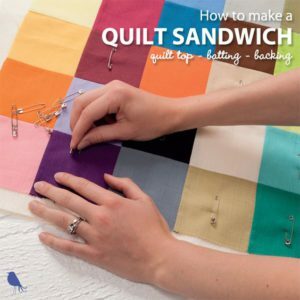 Take the quilt sandwich you just pinned together to the sewing machine. Make sure the quilt top is on top with seams facing up. You will use the edge of the pieced quilt top as a guide; sew ¼” from the edge, around all four edges leaving about a 5-6 inch opening along one side. The bottom two layers (the batting and backing) will be extending out beyond this edge – simply ignore that, it will all be trimmed off later. I have found it easier to start stitching long the middle of one side – about 2/3rd of the way down one side until I reach a corner. Leaving the needle down, through the fabric just left the presser foot and turn the quilt 90° and continue stitching along this side. After rounding the 4th corner stitch only about 1/3 of the length and stop. Where you began stitching should be visible and what you see is a fairly wide opening that is not sewn together. This will remain open to allow all the fabric to be brought through when turning. NOTE: It is important to back stitch a couple of times at both ends of the opening to prevent the stitches from coming loose and making the opening too wide. Taking a look at this quilt sandwich it doesn’t look too pretty and you may be asking is this how it is supposed to look? Seams from the quilt top are on the outside, all of the batting is showing and the edges of the backing and batting are uneven but we are about to fix that and even things up. We do this by going back to the cupboard and retrieving a few more items. This time: 1) a rotary cutting mat, 2) rotary cutter and 3) a quilting ruler. If you used a floor before to make your quilt sandwich, I strongly suggest you find a large tabletop, countertop or another smooth, flat surface to place the cutting mat. It will not only be easier but much safer as the rotary cutting blades are extremely sharp and you will be able to cut more accurately when trimming the edges. To decide where to trim again, use the edge of the quilt top as a guide. This should be as perfect a square as possible. Line up the quilt ruler even with the edge of the quilt top. The edges will be longer than the ruler so you want to line up the bottom edge of the ruler with the bottom edge of the fabric. Starting at this bottom right corner with the cutting blade positioned firmly against the edge of the ruler, cut through all layers of fabric. When you reach the top of the ruler, stop and carefully slide the ruler upward keeping the edge aligned with the edge of the fabric and continue cutting until you’ve reached the end of the first side of the quilt. 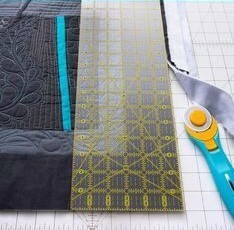 Turn the quilt, reposition the ruler and continue cutting in this manner until all four sides of the quilt sandwich are trimmed. Important Tip: When using a rotary cutter ALWAYS cut starting at pint closest to you and roll the cutter away –cutting in ONE DIRECTION only. If a couple of threads are passed over and not cut bring the cutter back down to the starting position and cut again in the same direction. NEVER roll the blade in a back and forth motion – this frays the fabric and creates a ragged edge that is difficult to work with. Now for the fun part – turning the quilt to create a “proper” quilt sandwich! Holding the quilt with both hands, use one hand to reach inside through the opening and grasp the opposite edge of the quilt and pull out through the opening. Keep working at it until the entire quilt is turned right side out. The quilt top and backing are now facing outward (the right sides aka the” pretty sides” showing) and the batting properly sandwiched inside in between the two print fabrics. This is an exciting step – the one that allows you to get a much better glimpse of what exactly the quilt will look like when finished. It’s also the beginning of the long awaited end. Just three more steps and this quilt sandwich will be ready for quilting! Let’s get started! 1. Smooth out the edges and fold the fabric at the opening inward trying to hide the opening. Once both sides of the opening are lined up take the quilt to the ironing board and iron the entire quilt so it lies nice and flat making sure the seam edges are straight along each edge. 2. Return to the opening and again, making sure both sides of the fabric are lined up use several pins to pin the opening closed. You don’t want this shifting while you sew. 3. The last bit of sewing involves doing what is known as top stitching. Using a colored thread that coordinates with the fabric stitch ¼” from the edge around the entire perimeter of the quilt. This not only gives the quilt a nice professional look it closes the opening we made (for turning) and makes it look like an opening never existed. NOTE: When ironing, No steam allowed – it will cause the fabric to stretch. A mild starch or just a spray bottle of plain water can be used to make ironing all these layers flat paying special attention to the edges. So far in this series we have discussed piecing the quilt top then making the quilt sandwich. The third and final part in our series will demonstrate a time worn and probably the easiest technique used for quilting. You attend a quilt festival, visit your local quilt shop or surf the web when a colorful fabric creation captures your eye. Your first thought, “I want to make that quilt” is quickly followed by a myriad of questions: Is a pattern available and do I need one? If so, where can I locate this pattern? How much fabric will I need? Do I need any special tools, techniques or skills to follow the pattern to make this quilt top? Next thing you realize, the idea of cutting fabric into strips, squares and rectangles then sewing them back together is not as quick and easy as it looks. Even with a pattern – and not all patterns are created equal – there may also be a little math involved. How large a quilt top make? Do I add a border or do I let the binding be the border and how will this affect the appearance of my quilt top? Today, I will answer the questions crucial to starting your very first quilt and in return you will have the confidence to piece your first quilt top from start to finish. Using precut fabric will save you a LOT of time and hassle! The fabric prints are from one fabric line so they already coordinate – no spending hours trying to locate 10 -12 different fabric prints that may or may not go well together. Being from the same fabric line all the fabric used for your quilt top will be of the same “hand” – consistent weight, thread count and fiber content. This ensures consistency of the quilt top in terms of fading, shrinkage and durability. They are “pre-cut” which saves you time preparing a large piece of fabric to be measured and cut. Cutting fabric is probably the most intimidating aspect of the entire quilting and piecing process. Eliminating that stress is invaluable! Our first quilt will be a simple layout (not a formal pattern) using a pre-cut fabric bundle known as a “Charm pack” and we will arrange those squares into a checkerboard-type pattern alternating a print fabric with a solid. This is how I officially began my serious quilting journey! A charm pack typically consists of a stack of 42 pieces of fabric cut into 5” squares and for this top we will be using one print charm pack and one solid charm pack – approximately 84 pieces of fabric total. Think of who you would like to make the quilt for – a friend, a baby, yourself – and choose a fabric suitable for your recipient. The solid charm pack will be a color that contrasts with the print – often white, off white, black or gray. You could choose a solid from a background color of the print but for this purpose I would avoid complicating things and go with a basic neutral. Now comes the fun part – deciding how to position your fabric pieces to create a pattern that is eye catching and visually pleasing. As you begin the layout you will soon notice the potential pattern designs are endless. I like to use a design wall – basically a large piece of felt attached to a wall. The fabric squares will stick enough to let me easily move them around while giving me a good picture of what the overall quilt top will look like once it is sewn together. To keep the print and solid squares evenly spaced throughout the quilt top each row will consist of an odd number of squares and rows. For our example, each row will consist of five squares (sewn side by side) with vertical seams. Next, each long row of five squares is sewn together making a horizontal seam. A solid square is paired with a print and sewn together with right sides together. Typically, a ¼” seam is sewn along one side. If your seam allowance is slightly larger or smaller no worries – what is important is consistency. EACH and EVERY seam needs to be the SAME WIDTH. Continue sewing pairs of squares – one solid with one print for each horizontal row. That will be (2) sets of (2) squares sewn together with one left over. Attach the left over square to the end of the second pair. Finally, sew the square pair set to the (3) square set and you have all five squares sewn together to complete your first row. Repeat this same process for each of the remaining (6) rows of fabric squares. Press the seams open. Yes, open. You may have read or were taught to press the seams to one side or “to the dark side”. Back in the day when quilt batting was not the quality product it is today, seams were pressed closed to prevent the batting from working out from between the layers of fabric. Today, that is not such an issue. Pressing seams to one side also involves creating a “pressing plan” and a few other unwanted and unnecessary headaches. That’s not what you’re here for – you want stress-free simplicity! 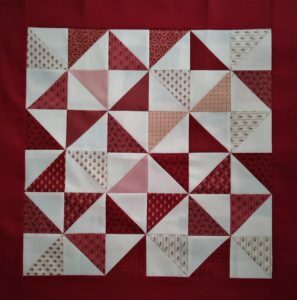 One word of caution when piecing together each row: Don’t be tempted to sew the squares in consecutive order – beginning with the first two squares then adding the third, then the fourth and ending with the fifth square. Don’t ask me why but when you do this the row will have a curved, bowed effect. It will not lay straight. Then when you are ready to sew the rows together vertically it will be almost impossible to get the seams to match up – which lead us to the final step in this process. The top is beginning to take shape. Starting from the bottom, turn the bottom row over with wrong side showing and place on top of the row above. Pin in place, “nesting the seams” so each vertical seam is perfectly lined up with the vertical seam above. Sew along the length of the entire row. Put that pair aside and repeat the same for next set of rows. Like sewing the squares together, there will be an extra row – go ahead and add it to the last pair of rows. Sew the first pair of rows to the second pair. Add to this the third pair and finally the last set with three rows. Press those seams open, lay it out on a flat surface or up on your design wall and admire! Now it’s time to give yourself and your machine a much needed rest and recap what you have accomplished. 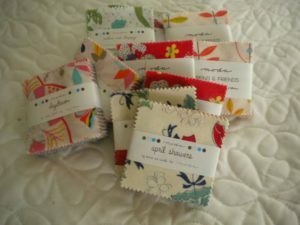 (2) Fabric charm packs – one solid and one print. 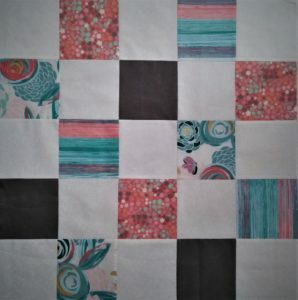 You now have 1/3 of your quilt completed and can begin to plan the next steps: adding a border, backing and batting to create the quilt “sandwich” to be discussed in a following post. Feeling comfortable and experiencing early success with this process is key to developing a long lasting and rewarding hobby or career as a quilter! Hello and Welcome to My Quilting Space! This is Susan and I have created this site for anyone interested in learning how to quilt. I am, for the most part, a self-taught quilter and as a result have first hand knowledge and experience of what works and what does not. Often, the way to learn what to do is the result of making a mistake – a lesson in what not to do! It is my hope to help you avoid expensive and time consuming pitfalls. I will also share what I consider to be the best tools and most efficient techniques to help you turn your stash of fabric bundles into a quilted creation of your own . Sometime during my senior year in high school I happened upon a stack of fabric scraps my grandmother had stored in her sewing room. Eyeing those fabrics brought back memories of the many dresses she made for my sister and I and the hours spent teaching me how to cut out pattern pieces and sew many of my own outfits. I wanted do something with all that fabric but what? My aunt who lived next door made hundreds of quilts in her lifetime but no one else in our family had any interest whatsoever in making quilts. That was over 40 years ago. At that time quilts were quite cumbersome and since I didn’t always have access to a sewing machine (or one that would accomodate multiple layers of fabric) piecing and quilting was often accomplished by hand stretched over a large round hoop or floor frame. They took up a lot space and required a lot of time and patience to just started let alone finish. What teen has time for that? That quilt was never finished. And over the next few years there were many starts and stops that resulted in too many UFO’s (Un-Finished prOjects) but nothing finished until 3 years ago. That’s when I began in earnest to learn to quilt. I joined a quilting group at the local hospital making lap sized comfort quilts for the patients and their families. This is such an easy and doable size – something I should have started with many years ago. Probably the most important aspect of quilting is having the confidence of knowing you can complete that project and do so sooner than you think. There nothing better than finishing what you have started and to know that what you have completed is an item that someone else would want to own. Sure, you cut fabric into designated pieces and sew them back together but the finished product is is your own creation. My new motto.”Finished is better than perfect”. I bought a magnet with this phrase written on it from a local quilt shop. It’s prominently displayed in my sewing room as reminder whenever I find myself ripping out more thread than I stitched! But Quilting Requires a Lot of Time and Experience, Right? Not anymore. Yes, there is a process and some aspects are more time consuming than others but getting the basics first and getting them right: accurate cutting, accurate seam allowances, using the right tools, will save time and your finished project will look as though it was created by an experienced quilter. There is no need to feel so overwhelmed and stressed out that you can’t take the first step! This site was created for YOU – the person who loves fabrics and quilts and wants to be able to create those colorful, imaginative, jaw dropping works of art but may not know exactly where to start. You have other responsibilities in your life and wasting time is not on your list. Neither is wasting money. I also want to show you that with the right foundation of techniques and a few tools that anyone, even you – with little time and experience – and with the desire to learn to quilt, can successfully create a quilt from start to finish. If you have any questions, comments or just want to say Hi!, feel free to comment below!